I love this traditional Italian recipe. Besides being quick and easy to make, it only has a handful of budget friendly ingredients. 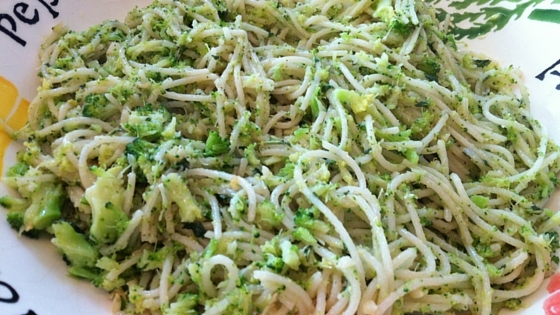 The twist I added to this traditional dish is mashed broccoli, which was inspired by my dad. Broccoli is full of essential nutrients such as: Protein, Vitamins A, C, E, K and B6, Calcium, Iron, Magnesium, and is a very good source of dietary Fiber. What a nutrient powerhouse! The traditional recipe also calls for parsley, but I use basil because of its full flavour. Cook pasta according to directions on box. Best when cooked until al dente. In a deep pan, heat the olive oil and sauté the garlic. Drain the spaghetti, adding it to the garlic oil (the spaghetti is easier to mix when still dripping wet). Stir in the mashed broccoli and basil. Season with pepper and serve with Parmesan cheese.